Can you understand this document reproduced below? No, thought so.Well this is the all singing, dancing model of the remains of the National Health Service after Andrew Lansley has finished with it. 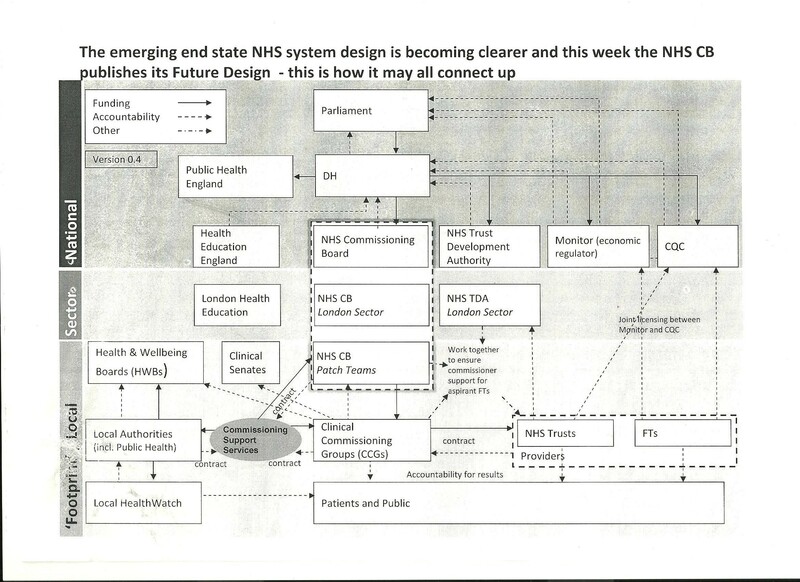 It is being distributed by the NHS Commissioning Board and a copy has come my way.Have you seen such a complicated diagram with different arrangements for accountability and funding? Far from creating fewer bodies it seems to create a plethora of new bureaucratic ones who will have more complicated relationships than a man with 20 mistresses. Note where the public and the patient – supposedly the focus of David Cameron’s reforms. They are hidden under three levels of bureaucracy at the bottom of this diagram – obviously the least important people around. Note all the new bodies, Public Health England, London Health Education, the NHS Commissioning Body, London;The NHS Trust Development Authority, London; Clinical Senates, Clinical Commissioning Groups, Patch teams ( I think they put sticking plaster on people when it all falls apart) the Care Quality Commission ( the body whose boss has just quit before being pushed and finds it difficult to monitor one home let alone all the rest) and a role for local authorities who being stripped of cash anyway by Eric Pickles, the communities secretary. There are also Commissioning Support Services – I think this is the bit where the private sector make their millions from the taxpayers before they take over the running of the hospitals. In my view this document gives a complete lie to the idea that some how we are going to have a wonderful bureaucrat free NHS with thousands of new doctors and nurses and patients with a sensational choice for everybody in England to go any hospital they want, regardless of cost. It more looks like a recipe for chaos, fragmentation, confused accountability and irresponsibility with taxpayer’s cash. This diagram illustrates why it is costing £1.3 billion to do this. 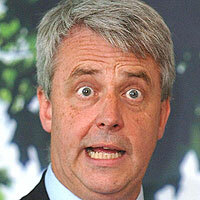 Andrew Lansley becomes excited when he see this wonderful NHS blueprint! This entry was posted in NHS, Whitehall and tagged andrew lansley, department of health, GPs, NHS reforms. Bookmark the permalink. Pingback: NHS reforms live blog – thousands to attend Westminster protest rally | BiZZBo@rd | Find People Who Share Your Business.